“Children of Lifebanc” is a unique way for children to become involved in the Lifebanc mission. The idea came from Evelyn Bass, a Lifebanc Donor Referral Coordinator, whose daughter has a passion for working in the rewarding field of organ, eye and tissue donation one day. But for the time being, Evelyn and her daughter, Rhyan, and son, Darnell, wanted to find a way to encourage those on the transplant waiting list. The Bass family got to work, and Evelyn spoke to different classes at school, explaining Lifebanc’s mission. She encouraged the kids to ask questions, providing a donation and transplantation learning opportunity. Amazingly, many students understood the importance of being a registered organ, eye, and tissue donor. Evelyn’s visits led to two fifth-grade classes at Barack Obama Elementary, in Maple Heights, creating handprints with inspiring messages for those waiting for a transplant. 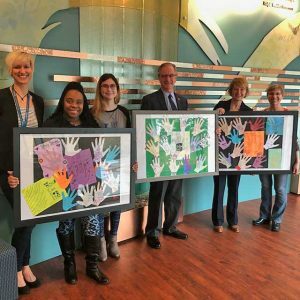 Lifebanc then partnered with the Transplant House of Cleveland to make sure transplant candidates in our area received the encouraging messages. Transplant House of Cleveland provides housing and assistance to people on the waitlist nearby at the Cleveland Clinic and University Hospitals. Elaine Turley, Executive Director of Transplant House and two guests, Molly Banville and her mom, Jenna, from Eliot, Maine, helped to accept the gifts. Molly is waiting for her second transplant and is staying at the Transplant House. “We look forward to hanging the artwork and having that splash of color in our hallways of Building 2,” Turley said. Evelyn and her family hope the program will grow from here, providing an opportunity for young students to learn about organ, eye and tissue donation while also giving support to those who are most in need! Register to be an organ, eye and tissue donor at www.lifebanc.org/morelife.